This is a fresh, healthy, easy-to-make salad with a twist to the usual restaurant versions. It can be served in small portions as an appetizer salad, or in large portions as a whole meal. This recipe is for 4 larger salads. A note on the grill - here in Utah, it is too cold to grill, so prepare the steak in the broiler or pan. Mix tomatoes, mozzarella, basil, 1 clove minced garlic, and 1 tablespoon olive oil in a bowl; toss to coat. Cover bowl and refrigerate. Place steak in a large resealable bag; add 1 clove minced garlic, 1 tablespoon olive oil, salt, and pepper. Seal the bag and distribute the oil mixture over the steak. Cook the steak on the preheated grill to your desired degree of doneness, about 5 minutes per side for medium. An instant-read thermometer inserted into the center should read 140 degrees F (60 degrees C). Let stand for 5 minutes before thinly slicing across the grain. Divide lettuce onto 4 serving plates; drizzle about 1 1/2 teaspoons balsamic vinegar and 1 1/2 teaspoons olive oil onto each lettuce portion. 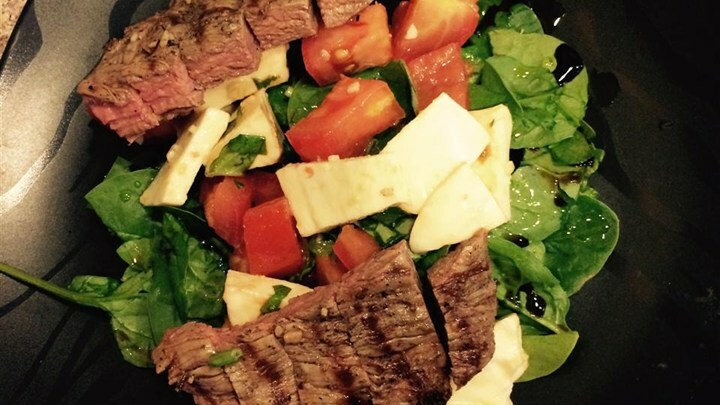 Top each salad with 1/4 the steak and 1/4 the tomato mixture. Christmas Eve Traditions with a Giveaway! A Fresh Take On a Bite of Heaven! 12 Easy Flavored Cream Cheese Recipes You’ll Want to Schmear on Everything! Which Food Tastes More Delicious Baked on a BURNT Baking Sheet?? The Ultimate Ice Breaker Questions!